Nine has renewed observational series The Embassy for a second series, according to Fairfax. 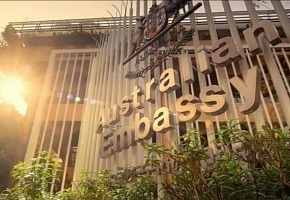 The series, filmed at the Australian Embassy in Bangkok, was well-received when it aired in October. Today it even led the Doco / Factual category in TV Tonight‘s Critics’ Choice Awards. “Utterly captivating and groundbreaking look at Aussies in trouble in Thailand. no-nonsense. Trudy McGowan was awesome both at her job and as TV talent,” said Debbie Schipp of News Corp said of the show. Thailand will also feature in Seven’s observational franchise What Really Happens in Thailand. Season Two of The Embassy will air in 2015. I’m surprised its taken this long to announce. Great!! More bogan holiday docu-dramas that make me ashamed to come from the same country as them. Usually in these situations everyone wants to see how a first season progresses. Given it went well it would open up possibilities for other partnerships through DFAT.